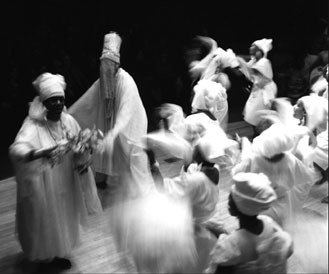 The Orisha Obatala is central to the creation myth of the ancient Yoruba cultures of West Africa, where he is also manifest in the "white gods" of creativity and justice: Orishanla, Oshala, Oshagiyan, Oshalufon, Orisha Oko, and Osha Funfun. He also provides the moral purpose of the historical king Shango, the Orisha of lightning and thunder. 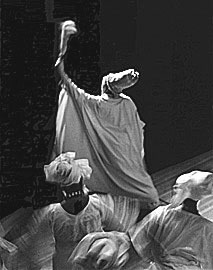 Obatala is said to have descended from heaven on a chain to mould the first humans and indeed to mould every child in the womb, although he is only one aspect of Olodumare, the Almighty God, who alone can breathe life into the creations of Obatala. A saint among saints and the archetypal spirit of creativity, Obatala has been carried to many cultures of the New World, where for centuries he has been honored as the patron of children, childbirth, albinos, and anyone with a birthmark. 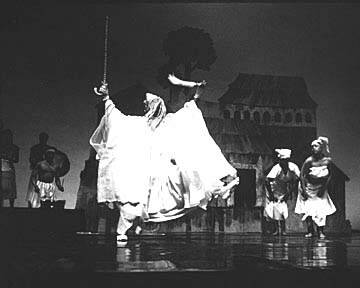 In the New World as in the Old it is said, "Obatala marks his children." 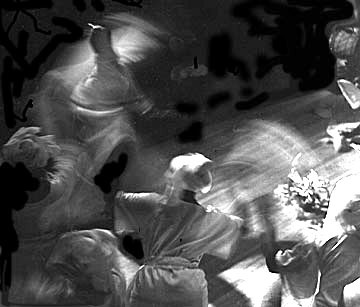 The gentle Obatala is associated with honesty, purpose, purity, peace, the New Year, forgiveness, and resurrection, which is why some authorities associate him with Christ and the Egyptian Osiris. As the divinity of created form, "the old man" is the patron saint of artists, called the Divine Sculptor. He is also called Alamo Re Re, the One Who Turns Blood Into Children. He is Alabalashe, the Wielder of the Scepter of Life, and he is O Ho Ho, the Father of Laughter, "Who sits in the sky like a swarm of bees." At the trial a silent, tranquil judge. The king whose every day becomes a feast. Owner of the brilliant white cloth. Owner of the chain to the court of heaven. He stands behind people who tell the truth. Oshagiyan, warrior with a handsome beard. Who holds the staff called opasoro, King of Ifon. Oshanla grant me white cloth of my own. Tall as a granary, tall as a hill. The king that leans on a white metal staff. 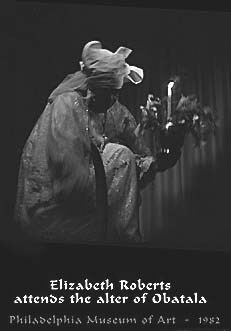 Oshala ~ reference from a poem of the Ogbehunle Odu, "The Consequences of Overzealousness in Prayer, Or How the Eye Got Its Pupil," recited by Alawonifa Animashaun Oyedele Ishola of Oyo for Wande Abimbola, Sixteen Great Poems of Ifa (1975, UNESCO, Paris), p.362-387 and p.460. Obatalá Obatalá is the kindly father of all the orishas and all humanity. He is also the owner of all heads and the mind. Though it was Olorun who created the universe, it is Obatal who is the creator of the world and humanity. Obatal is the source of all that is pure, wise peaceful and compassionate. He has a warrior side though through which he enforces justice in the world. His color is white which is often accented with red, purple and other colors to represent his/her different paths. White is most appropriate for Obatal as it contains all the colors of the rainbow yet is above them. 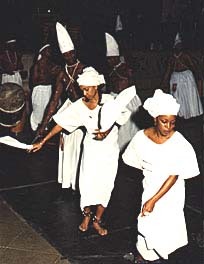 Obatal is also the only orisha that has both male and female paths.